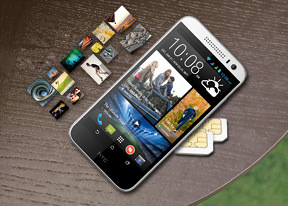 The HTC Desire 616 dual sim comes with both a modified Android browser and Chrome. The stock browser UI has been tweaked to match the Sense look and offers all expected features - incognito tabs, desktop site view, saving pages for offline viewing and more. Android 4.2 is actually old enough to still support Flash - not officially but you can sideload the APK if you wish. The downside of this is that the Android 4.2 browser is behind the times. Chrome gets its updates from the Play Store so you get the latest version. It lacks Flash but is up to date with the latest web technologies and can sync open tabs and bookmarks between devices. The Desire 616 comes with Polaris Office 5 - a popular Office document editor. It can handle editing of Word, Excel and PowerPoint documents and can also display PDFs. There's a built-in file browser so you can easily find your docs wherever they are. Instead of the Sense calendar the Desire 616 comes with - you guessed it - the stock Android calendar. Note that this isn't the new Google Calendar that took over from the AOSP app a while back. This one supports multiple online accounts and can do the job but we'd recommend installing the Google app. The Clock app can show the times in as many cities around the world as you wish and features a built-in timer and stopwatch. There's also a calculator app though it's so old it adds a menu key to the row of on-screen buttons. The menu key was deprecated with Android 4.0 Ice Cream Sandwich - not that this has any impact on adding numbers together but it's yet another area where the software feels thrown together in the dark. You also get a To-Do app where each entry can have an expiration date. Then there's a file manager to navigate both the internal memory and the microSD card and a Backup and restore app that can be a life saver if something goes wrong. Google Maps is the default mapping solution and probably the only one you need. It has excellent coverage and can provide voice-guided navigation in many countries. It helps if you save a map for offline use but even without that the vector maps are very data efficient. Traffic alerts and public transport route planning is available in some regions too. Note that the MediaTek MT6592 only supports GPS - there's no GLONASS or Beidou support. Getting a GPS lock took a while and you don't get the improved benefits from using additional satellites from the other two positioning systems. Having data enabled for A-GPS and Cell-ID positioning tangibly speeds up the process. The Google Play Store has flourished in recent years, but keep in mind that the HTC Desire 616 dual sim runs Android 4.2 Jelly Bean that came out in late 2012. Most apps support Android 4.1 or even lower but they won't be able to use all new goodies Google has added to the OS over the last couple of years.